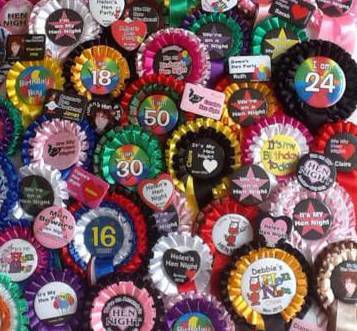 Personalised Hen Night Rosettes are becoming an increasingly popular way of enhancing our range of personalised badges. Traditionally rosettes used to have a basic coloured card at the centre. And then a bit of gold foil blocking for the text. By replacing this with one of our full coloured badges, we now have the option to give a fully personalised, high impact design to the rosette centre. This means that not only can we add a photograph , but we have also eliminated the need for a blocking charge. In turn this means that there is no minimum order. So you can order a custom badge for the Bride or Birthday person. And you will not be faced with a make-ready cost or minimum order charge. If you have an embarrassing photograph then this is a great idea for a party theme for your hen night rosette. Ordering your hen night personalised rosettes is easy. Choose your badge design. Then select the badge size for the hen night rosette centre 57mm or 75mm badge size. Using the rosette previewer on the ordering page, you can then assemble your own personalised hen night roasette. So having the badge at the centre of the rosette means that you can choose any of our badge design. Customise these with your own wording and with your choice of design. 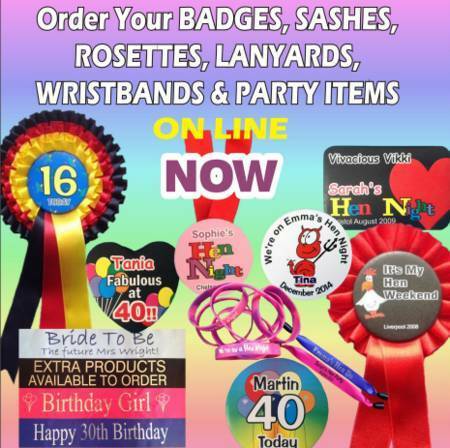 Details of the various design options are shown on our hen night badges and birthday party badges pages. As mentioned on those pages, a way to differentiate the badge for the Bride is to make it into a hen night rosette. The same option applies for the Birthday Party badges and birthday rosettes. All of our rosettes are hand made by us, so if you want a specific combination of ribbon colours to reflect either the wedding colour theme , a football team or club colour then we can do this. We always have most of the standard colours in stock, and so a quick delivery is assured. All our rosette ribbon is box-pleated which gives a full effect rosette which enhances the badge centre. The simplest option is the single coloured single tier rosette, followed by the double and the triple tier. Not only can the individual ribbon colours of the layers be varied , but we can also amend the tails. Again these can be varied according to your wishes. For a small extra cost (there is no minimum order) we can also print a customised message on the tails of the rosettes. The hen night rosettes, as well as our standard rosettes are supplied with a pin clip on the back which enables them to be attached to your clothing. We also can supply the rosettes for events other than hen parties, stag night and birthdays. We have alternative fastenings. So that if you want them for prizes for small animal shows or equestrian events then we have cage clips and bridle clips as alternative fasteners. In addition if you want the more traditional foil centre rosettes, in the more traditional colours, with the large gold positions - 1st, 2nd, 3rd etc which perhaps your company or association address around the outer edge, then this is also possible. However due to the blocking charge there is a minimum order, and a slightly longer lead time. So for all your customised rosette requirements, have a look at our badge designs. This will give you ideas for the design of your rosette centre. You can then order on line with your own choice of hen night rosette colour(s) to complete your personalised item.